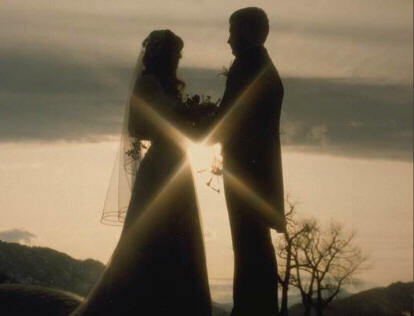 A Man And A Woman"
"What God Hath Joined Together, Let No Man Put Asunder"
Marriage Quotes are man's way (that includes women of course) of describing a sacred union between two souls united as one. In this day and age it seems that marriage is treated as something that should be quickly disposed of when things don't seem to be working as ones perception thinks it ought to. It's our hope that the following Marriage Quotes will help in some small way to expand the awareness of married couples in a way that strengthens the bond and encourages commitment in this precious union we call marriage. Our marriage quotes are hand picked favorites describing this most committed of relationships in the best way they can be described. The first section of our Marriage Quotes focuses on the more serious side of marriage. In the preceeding section you will find some Funny Marriage Quotes that are sure to brighten your day and make you smile. We hope you enjoy our Marriage quotes. Even The Strongest Relationships Need A Little Help Sometimes. Learn how to fall in love all over again. Best selling authors Gay and Kathlyn Hendricks show you how. Relationships Can Be Dramatically Improved Through Spiritual Awareness. Learn How To Tap Into This Incredible Power And Create Abundance In Every Area Of Your Life. Lifetime Guarantee. “I didn't marry you because you were perfect. I didn't even marry you because I loved you. I married you because you gave me a promise. That promise made up for your faults. And the promise I gave you made up for mine. Two imperfect people got married and it was the promise that made the marriage. In Life, There Are Only Three Problems. Money, Health and Relationships. You Were Created To Have Abundance And Fullfillment In All Of Them. Now You Can. Take The "Power Pause" 3 Steps 3 Minutes. We hope you've enjoyed our Marriage Quotes. Got a Marriage Quote you'd like to share? You can E-Mail it. We'd be happy to hear from you. Do you have any questions or comments on how we might improve our Marriage Quotes section? You can E-Mail them here. Your input is very important to us. It's purpose is to empower, inspire, coach, and guide you. The tips and tools within it will walk you step by simple step down the road to higher knowledge and a deeper, crystal clear understanding of how to acheive whatever it is you are looking for in your life, regardless of how many times you may have tried and failed in the past. If you can provide the will and desire we will show you how you can create a life beyond your wildest expectations. Finally you will come to know what it means to experience deep and lasting Abundance and Happiness. We will be adding more Marriage Quotes regularly, so be sure to check back often.